Idea Time® has already helped many entrepreneurs and business people just like you! It is also certified and accredited by the Institute of Enterprise and Entrepreneurs. Refocus yourself and your business, creative an action plan to accelerate your growth and achieve your goals – all in only 12 weeks. The Idea Time® Innovation Programme is essential time, just for you and because the time commitment required is no more than 45 minutes per week, at a time and place to suit you, you benefit from a flexible and personalised development experience that doesn’t require significant chunks of time commitment away from the business. There are plenty of programmes out there that focus on leadership, and just as many on business growth. The Idea Time® innovation programme is unique because it’s an experience that puts you, and what you want, at the centre. It takes you through a creative thinking process to build your plan for shaping your business so that it delivers for you on your terms.The activities and thinking approaches that we will use together on the programme will become an invaluable part of your professional toolkit. You will learn effective tools and techniques that can be used time and time again to tackle major issues and complex projects – and take your business, projects or ideas to the next level. 4 one-hour one-to-one coaching sessions with me, Dr Jo North, at a time to suit you. 12 fact-fuelled, hands-on, fun and results-focused modules, with extra bumper bonus bits. Your Innovation Giftbox – complete with your business plan playbook (also available online), idea cards and inspirational extras to get your creative mind working. 9 x Flipchart Friday videos jam-packed with innovation techniques that complement each session. Online support from me and my online Idea Time® Masterclass Community on FaceBook, supporting you every step of the way. (I will be in there every day to respond to your posts and questions, often dropping in impromptu FaceBook Lives on key discussion topics). An online FourSight assessment that will reveal your problem-solving preferences, as well as where you contribute the most to the innovation process. An Influencing Styles Inventory, to assess your communication style and improve your influencing skills. A certificate from the Institute of Enterprise and Entrepreneurs, which has approved the Idea Time® Innovation Programme. 3 FREE added extras exclusive to participants of the 7th January 2019 programme (see below). IWhen you sign up, we will send you an invoice, which will be payable on 6th February 2019. And the first 10 people to join the January 2019 course will receive an additional, private one-hour coaching session with me! I only open this programme three times a year and the next course begins on 21st January 2019, with an extra Launch Party on Facebook Live on 20 January. Either join live, or watch on replay if you can’t make it. Idea Time® is a 12-week online coaching and innovation training programme that will take you on a practical journey of setting, achieving and smashing your own lifestyle and business goals. help you take action every single day to grow your business in a way that works for you. Each week, a new part of the course will be revealed. Watch a video, do the exercises, share your progress in the Idea Time® Mastermind Community and track your journey in your playbook for the ultimate transformation. Oh, and join me live online (or watch the play backs another time) in our private FaceBook group each Sunday for an epic kickstart to the week ahead – you’ll love the ‘lives’! For the first 4 weeks of the Idea Time® programme, you will set your goals, learn about “whole brain thinking” and understand where ideas come from and how to have even better and more ideas to help shape your work, life and business vision. Week 1 – Bring your Big, Hairy, Audacious Goal (BHAG) to life. Week 2 – Boost your brainpower and increase your thinking potential. Week 3 – Learn how to create better business ideas and achieve more business outcomes. Week 4 – Create a plan to take your new product and service ideas to market AND deliver business-as-usual at the same time. During the second 4 weeks of the programme, you will learn how to leverage your networks – be that colleagues, associates or customers – to help you with your goals. Week 5 – Access the brainpower potential of your business network (aka your ‘mission squad’!). Week 6 – Create collaboration, and leverage positive creative tension to challenge your thinking. Week 7 – Do you sometimes feel like all the good ideas have to come from you? Learn how to access the latent innovation that lies untapped in the people around you. Week 8 – Use ‘whole brain thinking’ to make your business meetings really matter. During the final 4 weeks of the programme, you will make even more progress towards your goal and see the difference this innovation programme has made to your business. Week 9 – Understand and develop your own compelling and charismatic influencing style. Week 10 – Take your sales skills to a whole new level. Week 11 – Learn my top tips for dealing with “difficult” people and situations. Week 12 – Build your Power Moves Plan to maintain momentum and integrate your learning from the programme into your day-to-day leadership for continued success. Take your entrepreneurial skills to the next level and learn how to achieve sustainable high performance in just 12 weeks. FREE LIVE EVENT in Harrogate! That’s right! I’m putting on an exclusive LIVE event for everyone who signs up. This is exclusive to members of this course. Meet other like-minded business leaders, bring your goals into focus and sharpen your creative mindset to help you forge ahead! Ask me your questions live, meet a range of amazing experts and enjoy a day of exclusive training on me. Submit your business and marketing plans to me and I’ll give you detailed, commercially focused, INDIVIDUAL feedback on your plans. JOIN the amazing Idea Time® Mastermind Community. Get FREE lifetime access to my private Idea Time® Mastermind Community, a brilliant, motivational and supportive group of people who, just like you, are busy smashing their business goals and taking their businesses to a whole new level. PLUS, I go live in the group EVERY SUNDAY morning to get us all pumped for the week ahead throughout the 12 weeks. Wow! Access the course on the go! Idea Time® is 100% online! This means you can log in and work through the course any time, from anywhere in the world. Each week, a whole new section of the course will be revealed. You can access it at home, in hotel receptions, airport lounges, on the train or even on holiday! ABOUT JO: THE BUSINESS BRAIN WHO COMBINES INNOVATION THINKING, COMMERCIAL PRAGMATISM AND FOCUS TO CONVERT ASPIRATIONS INTO BUSINESS RESULTS. I believe that when we really get creative, productive and focused, we smash our goals and achieve way beyond our own expectations. When we spend time on what really matters it makes a huge difference; we cut through the noise, forge our path and fully achieve our potential. I am the architect of my own successful and varied career. I’ve held director level appointments at organisations including East Coast Mainline, First Group and Northern Rail. I run my own commercial coaching consultancy and I’m an Associate Lecturer at the University of York teaching Ideation and Strategy at Masters level. I completed my MBA and PhD whilst working full time (over a period of 11 years!). I have an exceptional track record for delivering innovation, business transformation and expanding the capability of leadership teams. The differentiators for any organisation are the ideas that come from its people. I have always been fascinated by what causes some individuals to progress and reach new heights, where others seem to hit a level and stay there. I was so motivated that I decided to begin my PhD to fully understand the characteristics and mindsets of these high-performing leaders, and the measurable, commercial outcomes that they generate for their organisations. I successfully completed my PhD in 2016 as a result of my ground-breaking research. In 2011, I founded The Big Bang Partnership Ltd, driven by my passion for individual and business growth. I have applied my research to help leaders and senior teams to achieve much more than they ever thought possible through coaching, facilitation, hands-on consulting and bespoke innovation programme development. 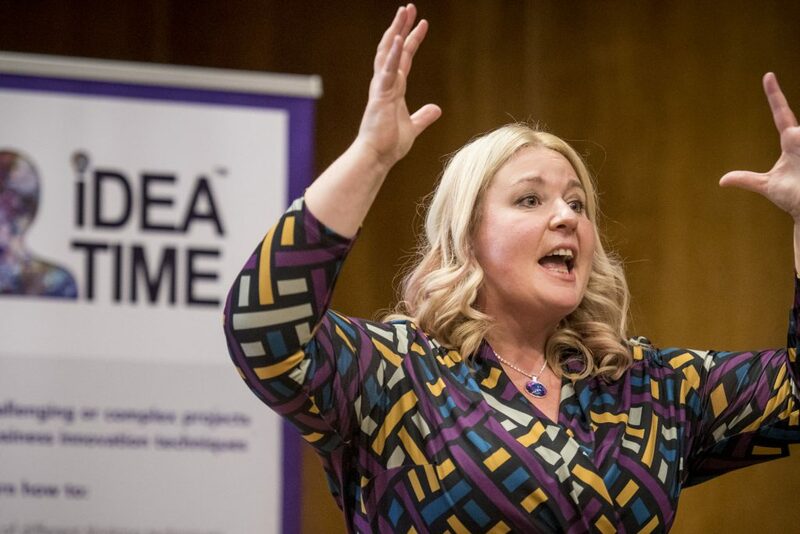 To reach more people and share the evidence-based insights from both my PhD research and commercial experience, I created Idea Time®, a high performance innovation programme. My goal was to create a time-efficient resource that equips busy professionals with tools and techniques to help them to make a step change in their work-life balance and personal impact and effectiveness at work by developing their entrepreneurial thinking, decision-making and influencing skills. 2018 | Idea Time is a registered trademark of The Big Bang Partnership Ltd.
“Idea time has been a fantastic experience for both me and my business, I started feeling really unclear about exactly what I wanted to achieve, how to progress and in truth I just felt stuck in time! The Idea Time process has been really great but most of all for really pushing me to look beyond the norm, I have realised in order to achieve what you really want you need to get out of your comfort zone. It’s been a massive benefit to really explore my options in depth and realising just how many I had to choose from!. Working with Jo has been fantastic and with encouragement and support she has shown me how to remove the blocks I was putting in place and move truly forward. Jo really understands what makes me tick and my default position which helps her keep me on track exactly which is exactly what I needed! The programme timing was really useful and worked perfectly on around 1 hour per week plus a call over a 12 week period enabled me to stay focussed but didn’t cause too many issues in terms of fitting into my busy schedule. Dr Jo is a very special kind of person. I worked with Jo during two innovation workshops and also on her Idea Time Programme. I would not hesitate, even for a second, to recommend working with Jo. For me several things make her stand out. Jo has incredible energy and a real, infectious passion for innovation. She has a great set of tools, techniques and approaches for creativity and ideation. Clearly experienced in using these approaches, Jo uses a range of interesting ways to bring them to life – making them usable, useful and fun! Creativity isn’t just about ideas though. Yes, Jo’s Idea Time programme leads to the creation of rich veins of ideas you might not have otherwise had. But it also focusses you on how to make those ideas happen. That’s where your ideas become valuable. If you have the opportunity to work with Jo, take it! I took part in Idea Time and found the combination of reading, thought-provoking activities, watching Jo’s Friday videos and one-to-one phone calls with Jo, extremely effective. Through this combination of teaching and learning styles, I learned a great deal about creative thinking applied to my particular workplace, team, and network of influential supporters of the work we do. Jo’s experience, knowledge, and gentle way of making great suggestions, has truly enabled me to move forward during a time of major transition for me; from being one of two Directors running our small organisation, to being sole Director, with a changing team, and the need to build a strong vision for our future. Idea Time, more than any training I have participated in, has had the largest impact on my practice, helping me to work more effectively with the ‘bigger picture’ and with those that are on this journey with me – from my immediate team to my wider network of colleagues across the companies we collaborate with.